On the vertical axis, a post-match assessment of how likely the outcome was based on the chances created during he match. The purpose of them is to provide a quick way to see how each match lived up to expectations and how surprising each result was. The first of these two numbers is a pre-match prediction of the match result based on how many goals’ worth of chances each team is expected to create, which is in turn driven by the two clubs’ current E Ratings. What happens is that the likelihood of each team scoring a specific number of goals in the match is calculated using a probability distribution function, and then all of the combinations which result in a home win are added up (i.e. 1-0, 2-1, 3-1, 3-2 etc). The same process is repeated for combinations which result in draws and away wins, so you end up with three probabilities – one for each of the three possible outcomes – which add up to 100%. The second number is the new bit, although it actually uses the exact same calculation method as above. The difference is that it takes the actual quality of chances created during the match as its inputs instead: the numbers you see on the match timelines that add up the “expected goals” value of all chances created by each team. The point of doing this is to quantify how surprising (or not) the outcome of the match was based on the chances created. This allows us to identify which games ended in a seemingly fair result and which results may have owed something to random chance. Having two values to compare will always draw me towards my favourite visualisation of all time: the noble scatter plot. Rather than commandeer the vividly-coloured versions that are the staple industry of this blog, I’ve gone for a more minimalist version in keeping with the style of my other matchday graphics. 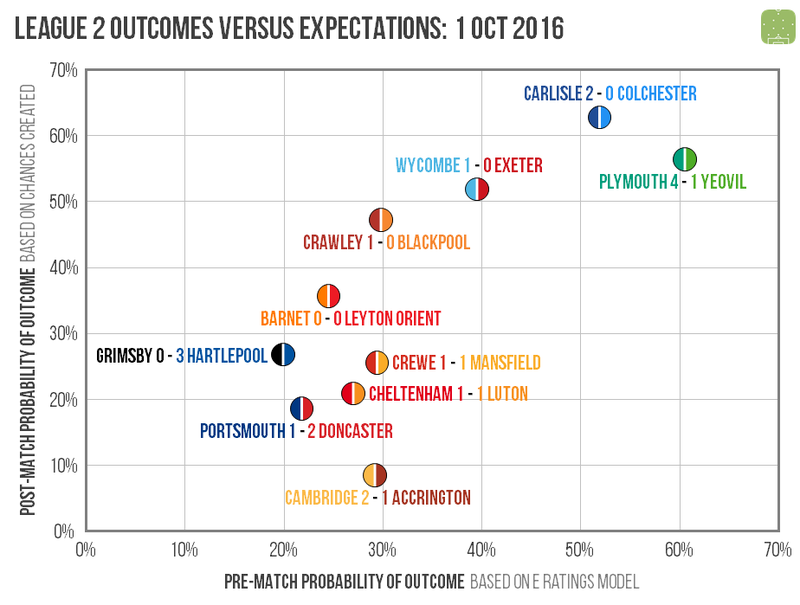 We can see that in the top right both Plymouth and Carlisle delivered on the pre-match expectations of them. Both were given a better than 50% chance of winning their matches (reading from the horizontal axis) and did so. We can see from their high position on the vertical axis that both victories look to have been deserved: the chances they created relative to their opponents were enough to deliver a win over 50% of the time. 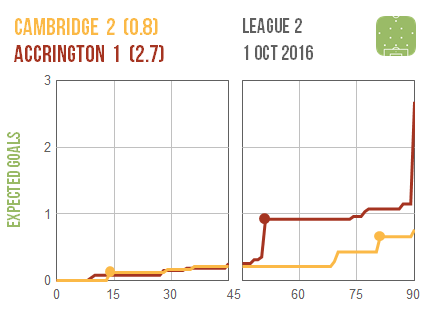 So Cambridge netted twice from fewer than one goal’s worth of chances while Accrington fired in attempts of around three times the overall quality. The huge leap in the visitors’ line is the two injury-time penalties that they failed to convert (as per the BBC match report), so we can see how easily this game could have gone the other way. 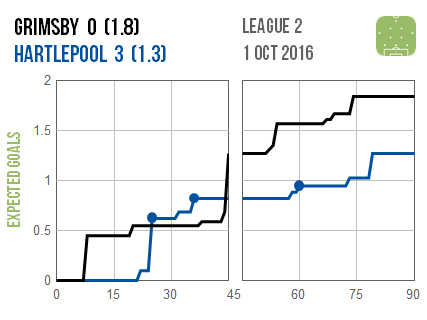 So this wasn’t quite as much of a smash and grab as the last one – hence it’s higher up the vertical axis – but while Hartlepool did more than enough to merit a place on the scoresheet, Grimsby can still feel a bit hard done by. They look to have created the better chances by around half a goal overall, notably a couple of close-range efforts in first half stoppage time, and could well have gotten something from this game on another day.